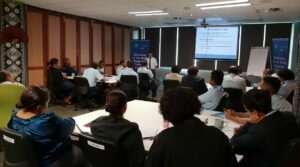 The Workshop on Rules of Origin (ROO) for the Fiji Revenue and Customs Services officials was held on 5-6 February, 2019 at the WCO Regional Training Centre, Suva, Fiji. The Workshop was co-facilitated by local pre-accredited ROO Trainer and the Oceania Customs Organisation. The pre-accredited ROO Trainer had participated in a three month ROO Train the Trainers Program run by Centre for Customs and Excise Studies, Charles Sturt University (CCES). 27 Customs Officials attended the Workshop from Suva and the Regional Offices. During the workshop, the participants were apprised the Concept of ROO, the methods of determining origin of goods, verification of origin procedures and the ROO under the different Free Trade Agreement which Fiji is a party to. The participants worked on a series of basic and practical exercises deepening their knowledge on the application of ROO. The Workshop concluded successfully with positive feedback from the participants and also highlighting the need for private sector outreach on ROO.